This is a common sight when I’m prepping to go out, local fishermen out and about, sea birds lining up to pick up their throwaways. There’s only one bird in this picture, but a queue of birds is not uncommon. Herring gulls and lesser black backed gulls mainly. It’s not surprising really as they’re out around high tide too, close to slack water the same as me. Not that I’m very tide dependent but pulling a boat out at a higher tide is less effort. I did quite a bit of work travel in the first weeks of February including a stopover on Holbox in Mexico. 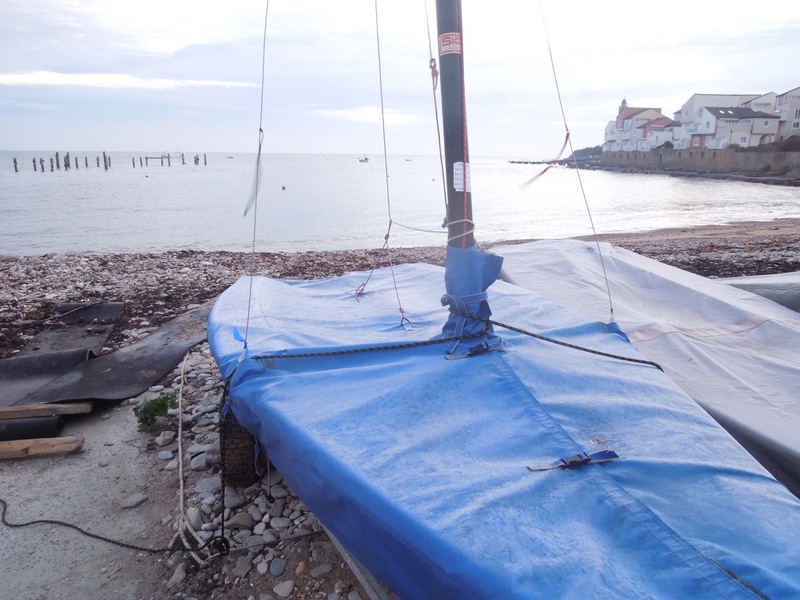 The Hobie Cat in the beach garden was tantalising, sadly unseaworthy amidst that beautiful environment with nice even onshore winds. And this past week back in the UK I did a RYA Dinghy Instructor course (yep, passed 🙂 ). We were super lucky with the weather which was mild and apart from one day had enough of wind. The DI course week was pretty intense with very packed days and homework in the evening. It feels a meaningful qualification to me, you can’t fake time on the water and sailing experience. 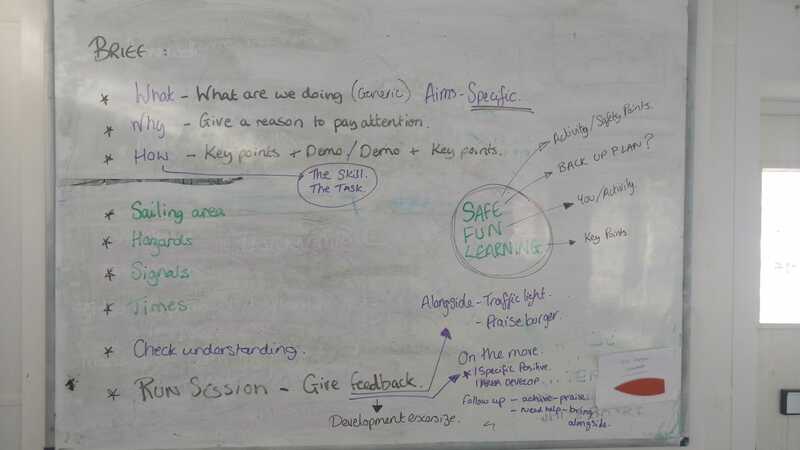 Apart from learning to teach sailing itself, the RYA instruction methods are excellent with much attention being paid to different learning styles, session planning, communications, feedback and everything else that goes into teaching effectively. Not to mention learning new sailing and power boat skills, a lot on safety, protection of children and vulnerable adults, organising your training fleet and conducting sessions on land or water. All good stuff and also a nice consolidation of my own sailing skills where more advanced manoeuvres need to be at demo level and work every time. As always, especially with sailing there is so much still to learn (it’s endless) and this stage still feels like the beginning. I’m grateful to Swanage Sailing Club for sponsoring the course and our great instructor during the week and coach/assessor on the final day. If you’re in the UK and want to learn to sail check out the RYA website. It’s a great scheme to learn with, consistent in method across the country and you might be surprised to find a training centre not too far from where you are be it sea, river or lake. So this was a first, taking the boat cover off with actual frost on it and going for a sail. Observations; fingers were cold and I need better gloves, particularly in light conditions where I’m not working hard and warming up. I switched to skiing gloves half way through which were good, though of course they would be useless if wet. I kept them dry. I’ve added some more instrumentation to the boat in the form of extra tell tales and added leech tell tales where they’d worn out. Looking at tell tales is nothing new to me, but having these extra ones really helps see airflow over the sail better. 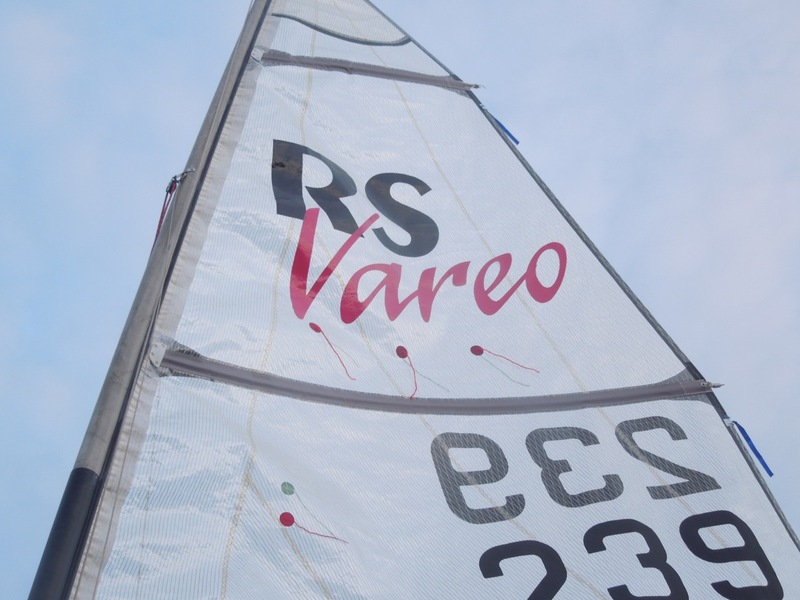 I’ve made a good start to the year so far with sails in my RS Vareo on New Year’s day and January 6th. Handheld VHF radio + backup phone in a waterproof pouch. Dry bag with different lengths of string, rope and shock chord, carbohydrate snacks, tape. I’ve experimented paddling a single handed and it works fine centering the rudder with a piece of shock chord tied to the toe straps. The knife is tied to the pocket of my buoyancy aid, the paddle further tied to the boat with a length of string. The other bits of string and rope should enable recovery from a few breakage scenarios I’ve imagined. Correct clothing is an essential part and I have the choice of a drysuit and wet suit layers. The drysuit plus over trousers is less fiddly to put on and dries quickly but I prefer the wetsuit set up which is very comfy on the boat. If you have cold feet, I can recommend Rooster’s polypro and thermaflex socks. We’re super lucky in Swanage to have a National Coastwatch station looking over us and I’m very grateful to have them there. There’s an RNLI station next door also overlooking the bay, but obviously no sailor wants to cause a call out. 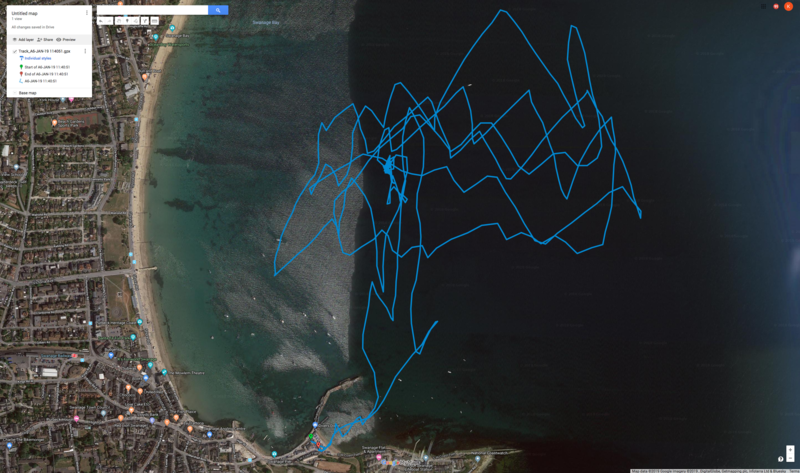 this was my first GPS tracking test, winds were light and I covered about nine miles. It’s curious how shallow the downwind angles are and it looks like I might be beating better on starboard than port, it gives me more ideas for things to work on. I need to get better at working with wind shifts and choosing the right angles downwind. And I’ve started in earnest with off water fitness. All in all, a good start to my sailing year. These little birds are members of the sandpiper family and called sanderlings. We saw them on a visit to Shell bay (Dorset, UK). They run along the shoreline at speed avoiding the waves, seem to like standing on one leg and even hop along at speed on one leg. More views from Shell Bay.